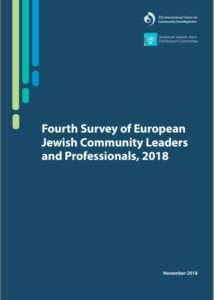 The Fourth Survey of European Jewish Community Leaders and Professionals, 2018 presents the results of an online survey offered in 10 languages and administered to 893 respondents in 29 countries. Conducted every three years using the same format, the survey seeks to identify trends and their evolution in time. The survey asked Jewish lay leaders and community professionals questions regarding future community priorities, identifying the main threats to Jewish life, views on the safety and security situation in their cities, including emergency preparedness, and opinions on an array of internal community issues. Examples include conversions, membership criteria policies on intermarriage, and their vision of Europe and Israel. The respondents were comprised of presidents and chairpersons of nationwide “umbrella organizations” or Federations; presidents and executive directors of private Jewish foundations, charities, and other privately funded initiatives; presidents and main representatives of Jewish communities that are organized at a city level; executive directors and programme coordinators, as well as current and former board members of Jewish organizations; among others. The JDC International Centre for Community Development established the survey as a means to identify the priorities, sensibilities and concerns of Europe’s top Jewish leaders and professionals working in Jewish institutions, taking into account the changes that European Jewry has gone through since 1989, and the current political challenges and uncertainties in the continent. In a landscape with few mechanisms that can truly gauge these phenomena, the European Jewish Community Leaders Survey is an essential tool for analysis and applied research in the field of community development. The Survey team was directed by Dr. Barry Kosmin (Trinity College), who has conducted several large national social surveys and opinion polls in Europe, Africa and the U.S., including the CJF 1990 US National Jewish Population Survey.